When my Grandparents built this house, starting in 1958, the neighborhood was only a few years old. My grandfather had worked for IBM in Endicott (at locations around the Binghamton area) for several years. In 1956, IBM announced they would be building a large facility in nearby Owego to house their Federal contract work. This of course began a mad stampede of development in the sleepy Owego area, where about 30,000 people lived. By 1980, the population would be 50,000, where it has remained. My grandparents and their family were one of the people who came and built a new house. Everyone around here gets the Owego Pennysaver Press – a quasi-news entity that mostly exists as a vehicle for getting ads and coupons to everyone. 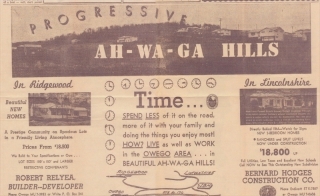 The picture below is an ad that appeared in the Pennysaver, probably very early 1960, advertising the neighborhood. A few things about the picture: No trees. The subdivision was created from farmland on a hillside. Our house is fairly small, but in the upper left portion. There are only two houses on the street: ours and the first house where our road begins (the white two-story a bit to our house’s right.) The developer has two neighborhoods: Ours is Ridgewood, which was fancier. On another hill nearby (right behind the IBM plant) is Lincolnshire. Today this plant is Lockheed Martin, and still employs about 3,000 people. It feels awesome to be so progressive. This entry was posted in house history on April 14, 2013 by Douglas Camin. What a wonderful legacy you have received…….